Robert E. Lee Revisited, 150 Years After Civil War The Confederate general looms large in Southern history — and that history will get special attention in 2011, as the nation marks 150 years since the Civil War began. Confederate Gen. Robert E. Lee still holds a distinct place in the history of the South -- a history that will be revisited many times in 2011, as the nation marks 150 years since the Civil War began. That bloody conflict resonates in culture and politics to this day, as Americans continue to debate the legacy of slavery and states' rights and consider the extent of federal authority. NPR's Neal Conan spoke with historian Noah Andre Trudeau, reporter Mary Hadar, and Joseph Riley, mayor of Charleston, S.C., about how and why we mark the anniversary of the Civil War. 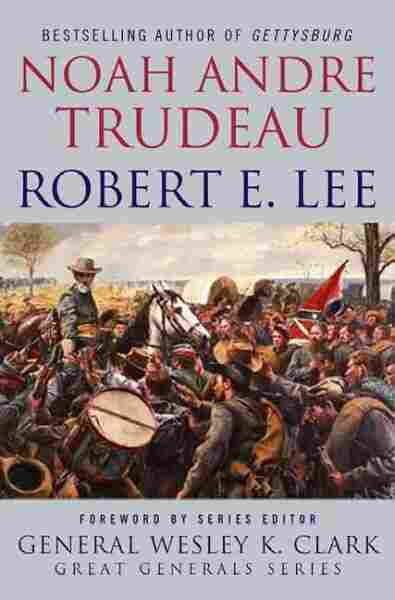 Trudeau, author of Robert E. Lee, says Southern leaders turned Lee into an icon as a way to save face after the destructive war. "They came up with the lost cause," says Trudeau. That explanation reframed the war and their losses in terms of the South's pride and perceived moral high ground, and cast the North's win as simply about their greater numbers. "They needed that iconic leader at the top of the heap, and Lee was the one they chose." Washington Post projects editor Hadar has been tweeting the events leading up to the secession of South Carolina. She's using original documents to compose her tweets, and has been struck by the emotional pull the material has on her. For example, Maj. Robert Anderson, the commander of Fort Sumter, was a "a heroic figure," she says, torn by the realities of fighting with the Union, against fellow Southerners fighting for the Confederacy. Riley will observe the anniversary of the Civil War with his constituents at a concert at Charleston Harbor. The city gathered a biracial group of citizens who spent two years deciding how best to mark the anniversary. "We will, among other things, play Aaron Copland's very moving Lincoln Portrait, and that will be narrated," he says. Though it's a politically tricky occasion, Riley hopes it will give everyone "an opportunity to fully understand the tragedies involved, and what it meant to our country." Virginia, marking moments of exceptionally dramatic turning points for Lee and America. General Robert E. Lee, newly appointed commander of the Army of Northern Virginia, departed Richmond around 1:00 P.M. accompanied by a few aides and orderlies. They rode east to the Nine Mile Road and followed it. As they did so they passed through some of the human debris of a battle that had taken place on May 31 near a once-picturesque road intersection called Seven Pines. 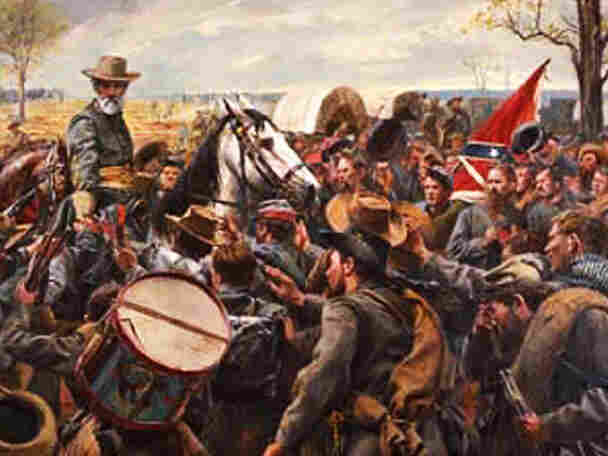 Under the overall command of General Joseph E. Johnston, some 20,000 Rebel soldiers had attacked a smaller Federal force holding an advanced position. At the end of the bloody day, more than 5,000 Rebels were casualties and very little had been gained. Counted among the fallen was General Johnston, whose wound was serious enough to force him to leave the field. His immediate successor in the army's chain of command quickly made it evident that he was in over his head and incapable of directing the substantial force the Confederacy had assembled to protect its capital. Later that day, Lee received a note from Confederate President Jefferson Davis which explained that Johnston was wounded and that Lee would succeed the fallen officer in command of the army. It was a daunting, even impossible assignment. A massive U.S. army had marched and bulled its way up the Virginia Peninsula to within a few miles of Richmond. Some efforts had delayed the enemy advance, but not once was a serious blow struck. Seven Pines was supposed to change that, but at the end of the day there was scant to show for all the blood spent. The task of turning things around had been given to Lee. He was ready. All his life, it seemed, had been leading to this moment. All his military skill, experience, leadership, and intuition would be needed if the nascent nation was to survive the next weeks. A staffer with the party pointed out the Hughes home, then serving as army headquarters. In just a few minutes, Lee would formally take command of the forces defending Richmond. Robert E. Lee and his staff drew up before the humble house and dismounted. Soon it would be all his responsibility to find a way to fight for peace. General Robert E. Lee looked deep into the darkness of a military field commander's worst nightmare. His once magnificent army had been cruelly whittled to a division's size by battle losses, disease, and desertion. Ahead and behind him was the enemy, determined and in great strength. To one side an impassible river, to the other rough country unfit for large numbers of men moving in formation. No training or experience ever prepares a soldier for the prospect of capitulation. Speaking with one of several staff officers and senior subordinates this day, Lee cut to the sharp edge of the matter: "The question is, is it right to surrender this army. If it is right, then I will take all the responsibility." Lee had carefully dressed in a new uniform that morning, including, as another officer present recollected, "sword and sash and an embroidered belt, boots, and gold spurs." A number of messages had already passed between the lines, trying to pin down the details for a meeting with the enemy commander, Lieutenant General Ulysses S. ("Unconditional Surrender") Grant. As each update arrived, Lee invariably queried the dispatch bearer for his opinion of how matters stood. Lee's principal subcommander, Lieutenant General James Longstreet, was characteristically blunt. "I asked if the bloody sacrifice of his army could in any way help the cause in other quarters," the officer remembered. "He thought not. Then, I said, your situation speaks for itself." The sun had eased past the meridian when at last a note came from Grant himself, acknowledging Lee's previous efforts to communicate his intentions, indicating his present course of travel, and deferring to the Rebel chieftain to select the meeting place. Some little details were settled and then it was time to go. Just a few hours earlier, when any hope of extracting the army from its dilemma had been extinguished, Lee confided to an aide: "Then there is nothing left [for] me to do but to go and see General Grant, and I would rather die a thousand deaths." Accompanied only by one staff officer, a courier, and a Union liaison, Lee began the slow ride down the hill to the village of Appomattox Court House, where he would surrender the Army of Northern Virginia. First he would make peace and then, perhaps, find peace. Excerpted from Robert E. Lee by Noah Andre Trudeau. Copyright 2009 by the author and reprinted by permission of Palgrave Macmillan, a division of Macmillan Publishers Limited.